I haven't opened a chain mail letter since my pen palling days in middle school. Unlatching my mailbox to find a package from Deanna, who makes chain maille from metal rather than paper, was a much more welcome surprise than being threatened with bad luck. In fact, wearing the serpentine, garnet and rose quartz beads in the jewelry she sent me from her You've Got Maille shop might actually boost my positive energy. 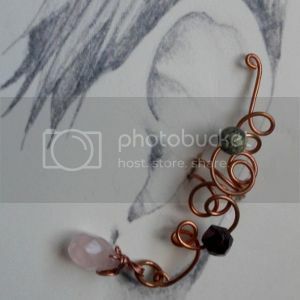 Isn't the wire ear cuff wonderful?! I've always liked the look of multiple ear piercings, but not the healing time or care that accompanies them. Her fantasy earring cuffs are the perfect way to embellish an entire ear without a single needle. She forms the sculpted wire so it bends around the cartilage of an ear, with no piercing required. And she has tons of wire colors (most made of enameled copper wire) and a variety of beads in her jewelry-making arsenal to design a custom cuff for any fashion taste. Very cool. I love ear cuffs.